When it comes to the weekend and a lunch date, whether it be with the girls after a shopping session or with your beau, the question is, how to look stylish on a weekend lunch date. You want to look smart but you don’t want to look like you’re off to the office for the day. How do you get a comfortable and stylish look for the weekend without crossing the line into your lounging around clothes and being too smart and a bit “meet the parents”? Simple, you take a few little tips from your handy French style handbook, yes thats me! 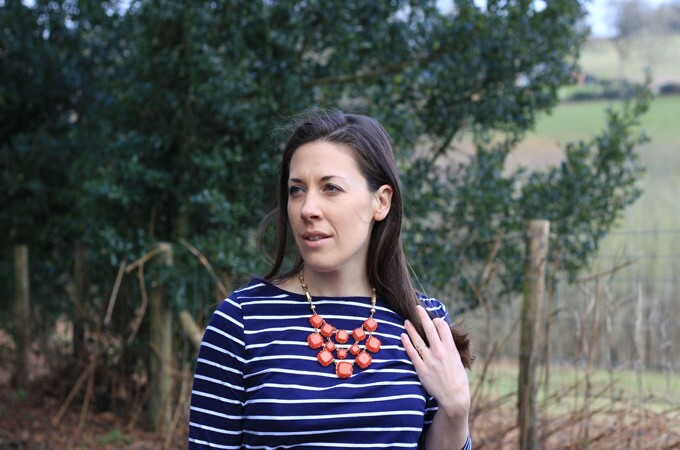 As one of La Redoute’s Brand Ambassadors I know a fair bit about “French Style Made Easy” and I am queen of the Breton stripe. 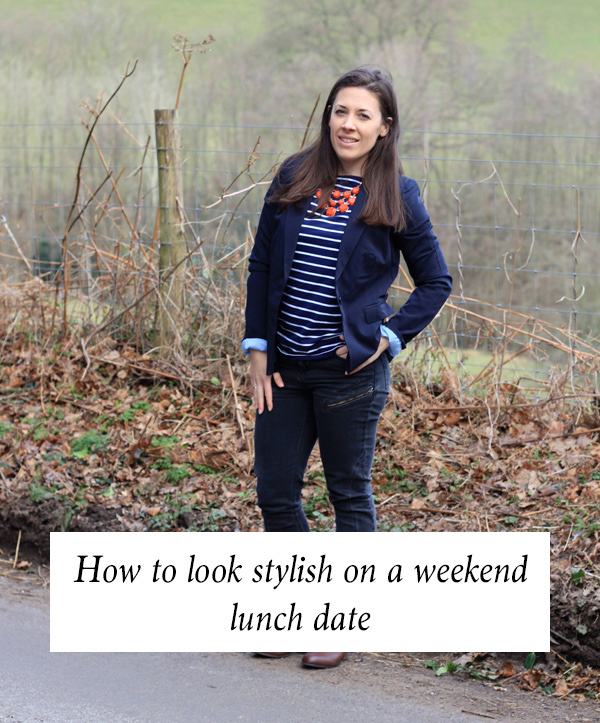 Here’s my outfit styled what to wear to a weekend lunch date. Take one Breton striped long sleeved top, preferably with a dark colour and a white stripe rather than white background; it’s a little less “sailor-y”. This one is a stretch jersey, fisherman style from R| Essential range at La Redoute. A little thick in weight so perfect for the transition into Spring. 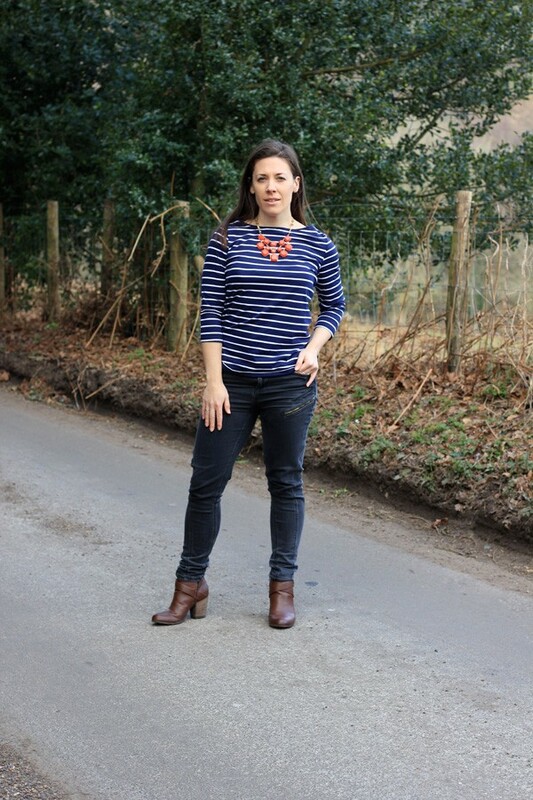 Team with dark skinny jeans and an ankle boot to be comfortable. Work this with a blazer with the cuffs rolled up. Not too Miami Vice style but just to break the look up from being too ‘office’ chic. 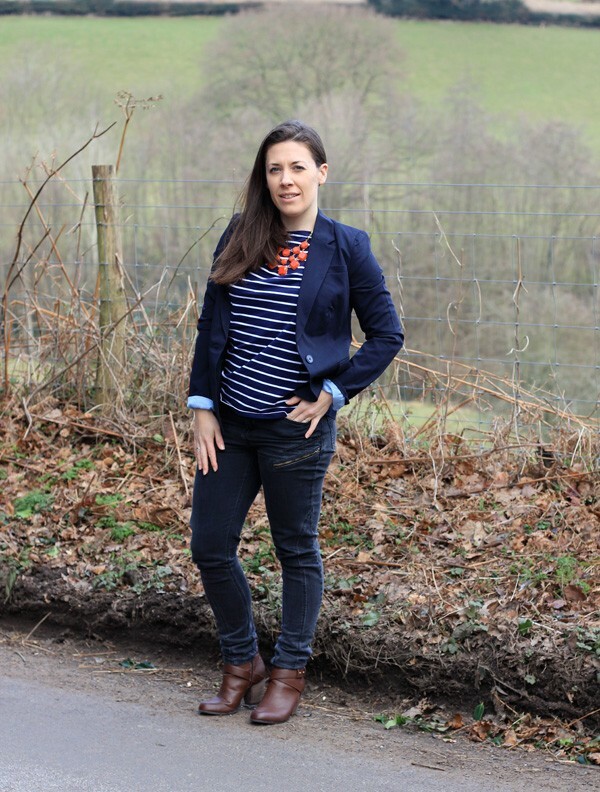 I love this navy long stretch fitted jacket with tailored collar from La Redoute; it works well with jeans or a printed trouser. In order to make a bold look and also add a little glamour to your lunch date, I would recommend accessorising with a pop of colour in a chunky necklace. I love this vivid orange and gold statement necklace from Stella & Dot. I wear it a lot to really bring an outfit up a notch. Who What Wear has a great style guide “The secrets of French Style”. I completely advocate keeping it simple, dressing for your personality and working a capsule wardrobe well rather than trying to follow the latest fashion trends. What’s your favourite look for a lunch date? What do you love about French style? P.S Have you seen the feather print dress from La Redoute and how I styled it?